On the left side of the page, you see a navigation menu containing the Lead, Contact and Account object plus custom Objects like Opportunity. By clicking the object name, you will navigate to the configuration page of that object. By clicking 'Add Object', you will enter a drop-down menu containing (custom) objects you can add to Record Validation. By adding them to the Record Validation Setup page, you will be able to configure them for further actions. 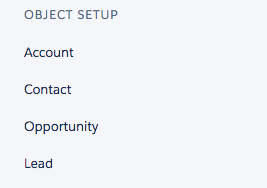 Object Settings allows you to customize and configure your objects. You can find settings related to the Record Validation Entry feature, or delete the current configuration. Learn more about Record Validation Object Settings in this article. On the Record Validation Settings page, you can configure the default country, enable or disable suggestions, show objects API names or change the default country showing format. Learn more about the Record Validation Settings page in this article. Address Validations Map fields, configure suggestions and display format. Learn more here. Country Validation Standardize, verify and format country names. Learn more here. Phone Number Validations Analyzes your phone number values and parses, validate and formats them to your preferred standardization. Learn more here. Email Validations Analyze email addresses to see if they are valid and have the right format. In addition, Record Validation does a Syntax, DNS, and Freemail check. Learn more here. On the Record Validation Licence page, you can few detailed information about your current subscription, what features are available for you, how many credits cost each validation and more. Learn more about the Record Validation License page in this article. The Record Validation Auto Process feature lets you auto validate a batch of records with the desired settings defined by you. Learn more about the Record Validation Auto Process feature in this article. On the License page, you can review a detailed audit of recent validations, what status they had and how many credits the validation costed, who ran the validation and more. Learn more about the Record Validation Transaction page on this article.